As much as your father may enjoy a funny card or a "#1 DAD" mug - we know there’s no better way for him to celebrate Father’s Day than by spending quality time with those that call him “Dad.” Check out these Father&apos;s Day specials and events going on this weekend in Mesa, Arizona! T.C. Egginton’s- Bacon up something special for Dad this Father’s Day by having a delicious brunch at T.C. Egginton&apos;s. Sunday, June 16 they will have an extra special treat in store for you Dad - a Bacon Bloody Mary! Organ Stop Fathers Day Musical Luncheon - If your dad loves a good buffet, check out Organ Stop this Father’s Day for a musical all-you-can-eat lunch. Organ Stop Pizza is home to the Mighty Wurlitzer organ, built in 1927, and boasts more than 5,500 pipes, making it the largest Wurlitzer in the world. Please note to attend this event, a ticket must be purchased in advance. Rockin N&apos; Ranch - Celebrate Father&apos;s Day a day early on Saturday, June 16 by traveling back in time to the Wild West where you will witness a Gunfight at the O.K. Corral! 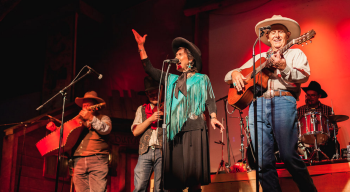 Top the night off by enjoying the all-you-can-eat barbecue beef (or chicken) dinner followed by the western stage show performed by the Rockin’ R Wranglers! That&apos;s not all, to the night the Arizona Gunfighters will reenact the most famous gunfight in the history of the cowboys! Mesa Market Swap Meet - Take Dad down to the Mesa Market Place Swap Meet to pick out the perfect gift for himself this year. On Saturday, June 16th 10 am - 3 pm in the Main Restaurant where there will several giveaways including Kartchner Caverns Passes, Day Passes to Arizona State Parks, Camping gear and so much more! Desert Belle - Take a cruise with the Desert Belle to get to know the area! In addition to two daytime nature cruises, the Desert Belle is offering a more relaxing boat ride for Father’s Day featuring live music at night. A ride on the Desert Belle is sure to put dad in the relaxed state he deserves! Usery Moutain Regional Park - If your dad loves the outdoors we have just the thing: a fmoon night hike to hunt scorpions! 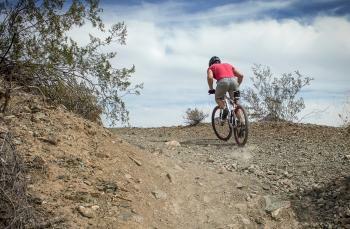 Experience the sights and sounds of the desert at Usery Mtn. Regional Park, after hours. Resident Ranger JD is hosting a 1.3-mile hike to hunt Scorpions on the eve of Father’s Day. All you need to bring is water, a black light, closed-toe shoes and your sense of adventure. Insider tip: You can pack up all the fixings for a BBQ and head to Usery Park early to grill dad dinner before heading out on the hike. 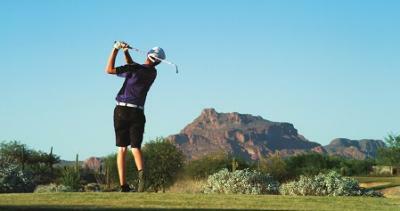 Arizona Golf Resort - Does your father link to hit the links? He can play more than 18 holes on Father’s Day with Arizona Golf Resort’s All-You-Can-Play golf special. Dads play for Free! Golf carts and great food and drink specials are included! Longbow Golf Resort - Tee up at Longbow Golf Club where Dad can play for free when accompanied by a spouse or adult playing partner who pays the public rate. This course was recognized as one of the “Top 100 Resort Courses in the Country” and ranked as “One of the Top 20 Best Courses You Can Play in Arizona,” by Golfweek. MIM Fathers Day Drumming Workshop - Come join Beat It! Family Drumming Workshop and learn the basics of African, Latin, and pop-music hand drumming with master instructor Frank Thompson which wraps up with a real jam session. Space is limited. Ticket purchase is required for children ages 4 and up and children ages 3 and under who will fill their own seat. Museum admission may be purchased separately. I.D.E.A Museum Multi-Generational Fathers Day Tinker Workshop - Imagine, design and experience art with your dad. 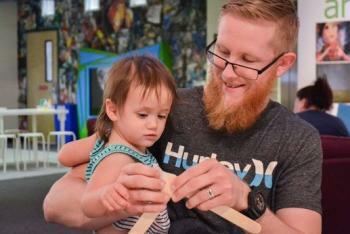 Create life-long memories while learning and interacting with all of the fun exhibits in this hands-on children’s museum. The are bound to have fun using their imaginations together. Plus, on Father’s Day, Dads will receive FREE admission. Superstition Mountain Museum - Celebrate a day with dad at the Superstition Mountain Museum. All fathers and their children get FREE admission on Sunday. Have fun spending time with your kids at this fun and exciting museum learning about the legendary Lost Dutchman.